If you have not been diagnosed with diabetes, but are experiencing symptoms, you may be at risk for prediabetes, also know as stage 1 diabetes. Symptoms of prediabetes can be subtle, but prediabetes can be reversed. If you have not been diagnosed with diabetes, but are experiencing symptoms, you may be at risk for prediabetes, also know as stage 1 diabetes. Symptoms of prediabetes can be related to high blood sugar and insulin levels. If you have any signs of prediabetes, or even think you do, contact your healthcare provider. You can discuss your symptoms and ask for tests. Also keep in mind that most people do now have prediabetes symptoms, so checking for symptoms is only one part of finding out if you are at risk. · Increased thirst and more frequent urination. · Tingling or numbness in your fingers or feet. · Unexplained low energy levels. · Slower healing of cuts and minor wounds. Still, it is important to know that not only might you not get symptoms with diabetes, but you are unlikely to have symptoms with prediabetes. That is why you should know your risk. You are more likely to get symptoms if your blood sugar stays high for longer periods of time. This can happen if you have prediabetes or diabetes and do not manage to get your blood sugar to target levels. · Increased thirst and more frequent need to urinate. The thirst results from too much sugar in your blood, similar to excessive thirst when you eat salty foods, and the extra urination comes from the need to excrete that extra water and sugar. · Fatigue, which results from your cells literally being low on energy because they are unable to get the glucose, or sugar, that they need due to insulin resistance. · Weight loss and hunger, again as the result of insulin resistance. Instead of extra sugar from carbs in your food being converted to and stored as fat, it gets excreted from your body. · Blurred vision, slow wound healing, and dry skin. · Being overweight or obese. · Being 45 years or older. · Having a parent or sibling with type 2 diabetes. · Are African American, Hispanic American, Asian American, Native American, or Pacific Islander. Additional risk factors for women are if you had gestational diabetes, gave birth to a baby over 9 lb., or have polycystic ovary syndrome (PCOS). Only 1 in 10 people with prediabetes know they have it. Reasons may be because they do not have symptoms or do not get diagnosed with it. Since being diagnosed with prediabetes can motivate you to make healthy changes to prevent diabetes, you should learn your risk factors and act if you have one or more. Do you match any of the signs and symptoms above? Don’t wait for prediabetes to become diabetes. Let Lark Health help you develop healthy habits and lose weight, so you can focus on what really matters - living your life. Take Lark’s 1 minute quiz to check your symptoms, and you could be eligible for a free Fitbit and SmartScale. So what are prediabetes and diabetes? When you are healthy, your body breaks down carbohydrates from food and turns them into glucose (a type of sugar) that goes into your blood. As your blood sugar (blood glucose) levels increase, a type of cells in your pancreas secrete a hormone called insulin. Insulin helps your fat, muscle, and liver cells to take up glucose from your bloodstream. · Your cells become less insulin sensitive, or more resistant to the effects of insulin. · This means your body requires more insulin to remove the sugar from your blood. · At some point, your insulin supply cannot keep up with demand, and your blood sugar levels rise. The progression can take years or decades, but you can stop or slow the progression if you make healthy changes such as losing weight, exercising more and planning a healthier diet. Lark can help you plan your 2019 diet here. The CDC-recognized DPP is focused on the lifestyle changes that can reduce or eliminate symptoms of prediabetes. It is designed to help people with prediabetes lose weight, eat better and increase physical activity. Compared to a control group, the participants who were in the DPP group had a 58% lower chance of developing diabetes, and this number was 71% lower among people who were 60 years or older! Many DPP programs involve in-person meetings weekly, biweekly, or monthly in a group setting. Lark DPP is an alternative to these meetings. Lark DPP provides the same curriculum, and has some advantages. · Conveniently delivered lessons through your smartphone – no need to drive to a meeting at a set time. · Extra coaching beyond what is in the DPP curriculum. · 24/7 availability so you can chat with your Lark coach anytime. · Personalized feedback on your progress. Prediabetes symptoms are a sign that your body is asking for help. Even without symptoms of prediabetes, you may have risk factors for prediabetes or diabetes, and it could be time to act. Instead of ignoring the symptoms, use your prediabetes symptoms as motivation to get healthy, and know that help is available. See if you qualify for a free Fitbit and SmartScale from Lark Health in 1 minute with the quiz below. 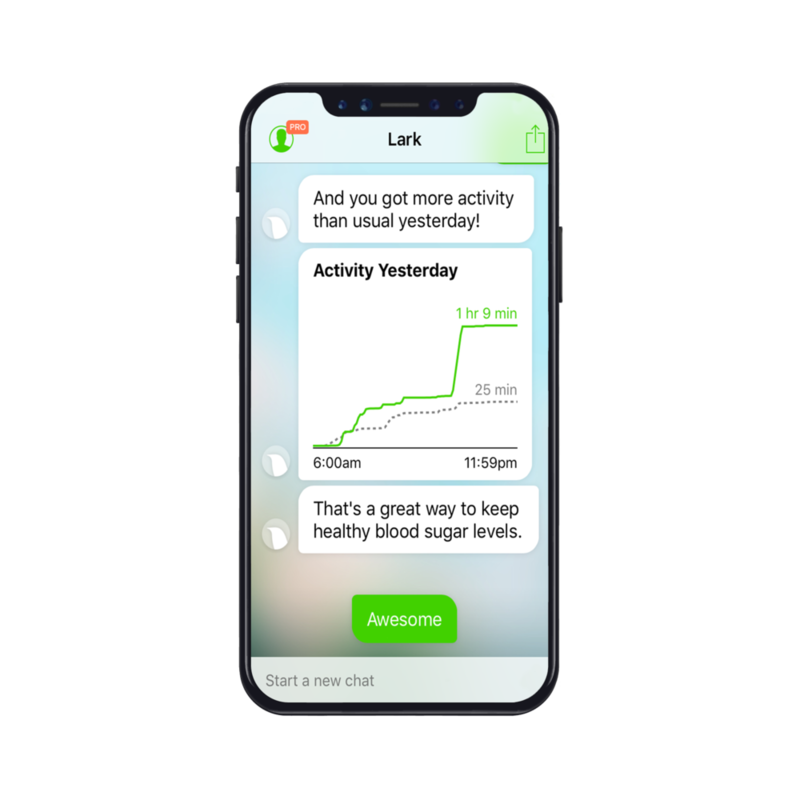 A new study reveals that artificial intelligence mobile app Lark could be a useful tool to help patients with Prediabetes prevent Type 2 diabetes. The study, published in the Journal of Medical Internet Research, showed that patients at risk of Type 2 diabetes who had Prediabetes and who used the Lark Weight Loss Health Coach, dropped their baseline weight and increase their percentage of healthy meals eaten by 31 percent. How Employee Wellness Programs Really Work!